Pascal Archimède suggests looking back at his great-aunt’s life, Gerty Archimède, a Guadeloupean lady who made her island shine all around the world. I still have the memory of a pleasant and affectionate woman towards my sister and me, who would kindly play with us when we visited her with our parents. It is only a few years after she passed away that I realized how lucky and privileged I had been to know this great lady, a "pillar" woman, who, worked all her life for justice, equality and peace. Gerty, Marie, Bernadette Archimède was born on April 26th, 1909 in the parish of Morne-à-l’Eau in Guadeloupe. She was the eldest of 5 siblings. Her father, Justin Archimède, an artisan baker, also mayor of Morne-à-l’Eau from 1912 to 1918 encouraged his daughter to pursue higher education at a time when a great majority of the local population was working in sugar cane fields. After graduating from high school, Gerty worked at the Bank of Guadeloupe to finance her law studies. She started them in Martinique and finished them at Sorbonne University in Paris. 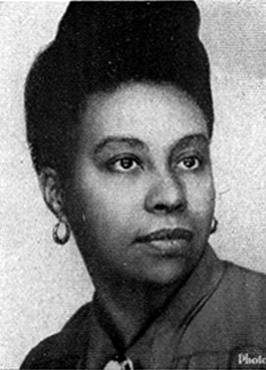 A law degree holder, she became the 1st female attorney to be registered at the bar of Guadeloupe. She would then pursue an active political career. In 1945, she was elected general councilor. In 1946, two years after women got the right to vote and sought election (by order of 21st April 1944), she became the 2nd female afro-descendant, after Eugénie Éboué, to become a Member of Parliament. In 1948, Gerty joined the French Communist Party that she would represent in numerous conferences around the world. In 1952, she rejoined the Bar of Guadeloupe and got specialized in the defense of low income workers and people. In 1953, she became the deputy mayor of Basse-Terre and would be elected mayor of this parish in 1956. As a feminist activist, she created, in Guadeloupe, the Federation of French Women which would later become the Union of Guadeloupean Women with the aim of obtaining the enforcement of the Social Security entitlements and the right to retirement for Guadeloupean women. In August, 1969, she distinguished herself by defending Angela Davis and her companions, stuck in Guadeloupe and threatened with prison for anti-colonialist propaganda. She presided over the 7th congress of the Guadeloupean communist party on May 17th and 18th,1980. 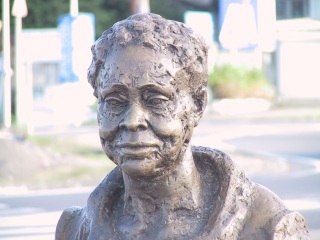 She passed away on August 15th of the same year in her house in Basse-Terre. During her various political terms, Gerty Archimède stood up for equal rights and justice between the West-Indies and Mainland France by embodying the fight against inequalities. 2019 has been declared " Gerty Archimède Year " by the regional council of Guadeloupe.